Did a bit of window shopping yesterday - headed back to Fowles in Clayton to check out their floor display. Plenty of laminates and timber floors to look at, but not so many in the greys that we're after. There was another flooring place nearby, and we picked up a couple of samples from there as they had two that are close to what we're wanting. These samples are from Tarkett, a German brand. Also sold in Bunnings, but they only have a few samples from a different range. 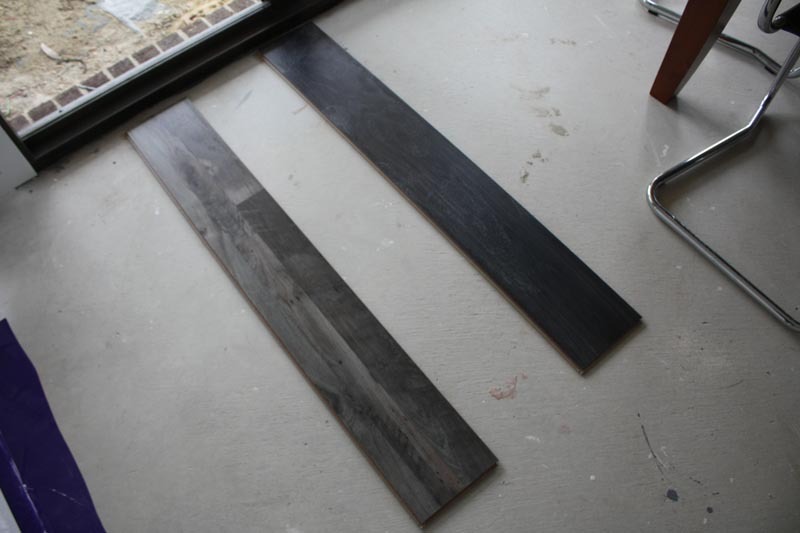 Both of these samples are commercial market laminates, and the one on the left has lots of variation. When you combine it with a few other boards, the visual board width varies, so some boards appear twice as wide as the other ones. There are also "imperfections" printed into the laminate (not in this sample board); so this board would look perfect in a funky clothing store, or maybe a laneway cafe. The board on the right has a lot more consistency and has a definite black/charcoal tone to it. Matches the charcoal stain on our door, but over a larger open area perhaps will be too dark. Closer.... and you can see how the darker board shows up footprints - but then again, with our current slab exposed we're getting heaps and heaps of dusting. The lighter board shows up hardly any footprints at all. You can also see the click system they use, similar to all the laminates in the market where you can just "click" the boards and they lock into place. I think we're leaning towards the lighter one, as it suits our grey neutral colour scheme better, and shows dirt/dust less. So, just like evaporative cooling vs refrigerated aircon described previously, all the various floor systems have their pros and cons - for us, the main thing is the colour and appearance of the floor, and we can't find the look that we want in a real wood or bamboo floor (plenty of reds and browns, no greys) - so far only laminate. 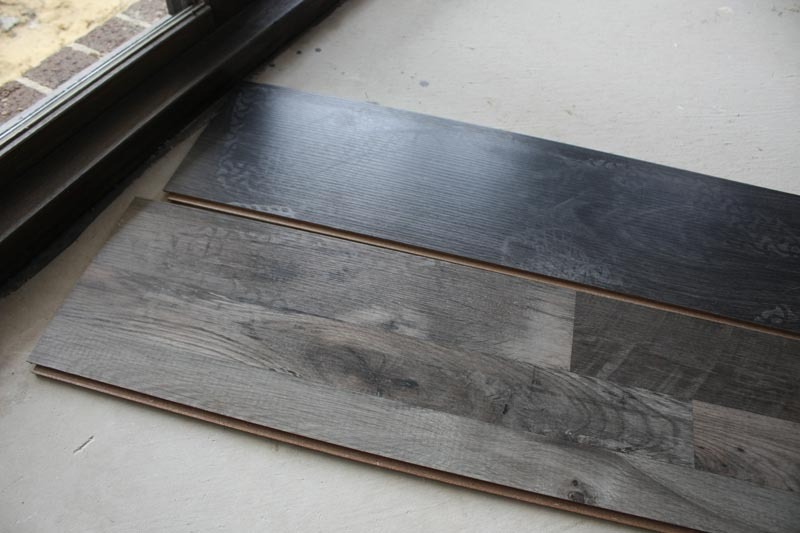 Haven't looked much into vinyl planks, but I imagine they'd be able to produce a grey vinyl plank with no difficulty. Anyway, not going to settle on a colour yet as there's plenty of other retailers to check out - though we're hoping to have picked one and have it delivered to our house before the Melbourne Cup weekend. Plus I need to get stuck into preparing the slab for the floor; which means many painful hours on hands & knees, using a hammer & chisel to knock off all the excess plaster and gunk that has built up on the slab. Had a little dinner party with some old friends last night, and got a Lemon Meyer tree as a housewarming present - awesome! Always had plans to get one (to supply the necessary lemons for Coronas) so hopefully today we'll pick up a big pot and some advice to keep this thing from dying - we don't have a good track record with plants, but I think we'll put some effort into keeping this one alive! Hi guys, I personally looooooooooove the darker wood, it's so moody and glamourous especially at night with the lights on, just gorgeous!! and remember, you're not always going to have concrete and building dust around your home so there won't be any shoe prints on the boards. If you go over it daily with a soft microfibre mop, it will always look brand spanking new. I would recommend you try the flooring place called United Global Enterprises. They are located at 11 Harper St, Abbotsford. They have a very good selection of flooring and is competitively priced. For the price of what you can get with laminate elsewhere, you can probably get hardwood with them. We are planning to use these guys once our house build finishes. Agree 100% with Helen. We are having the same darkish laminate flooring though it has some sort of color variation to it not just all black (i.e brown, dark red, black etc). We think the dark color is "high end" and stylish comparing to say, red or yellow/white flooring. We remember a magazine featuring our favorite actor, Brad Pitt's home. It was sooooo super stylish with darkish flooring. We said at that time, we MUST have it !!!! T & T, please go dark flooring, you will LOVE it.